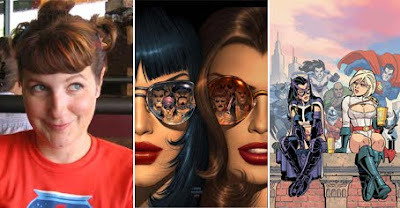 Her biggest hits may be VAMPIRELLA and POWER GIRL but Amanda Conner isn't so much a 'cheesecake' artist as she is a specialist in good, fun comics (remember those?). Like artist Kevin Maguire, her clean illustration style has a knack for perfectly capturing facial expressions, and the humour of the moment. IF I WAS E.I.C SHE'D NEXT APPEAR ON: PLASTIC MAN. Paired with a character who can reshape his body any way imaginable, Amanda's sense of humour would have found it's perfect partner in crime. Amaznda Connor is fantastic. I dont thin Power Girl will be the same once she leaves the book...if she ever does. THE most underrated storyteller in comics. As mentioned, her facial expressions and body language are tops in the field and typically tell the story without the need for dialogue. Terrific post for a most deserving artist!! She did a superb job on the WC Supergirl strip! I think the cat-bath scene is a great example of her strengths. You don't need to click/enlarge it to get what's happening, even reduced the story get's through as easily as it does at full size. And the facial expressions.. well those just put her in the same league as next weeks artist.